Real Estate Law 9 Edition Clear, concise, and current, REAL ESTATE LAW, 9th Edition, combines practical legal examples with theory and case law to provide a comprehensive picture of the field. 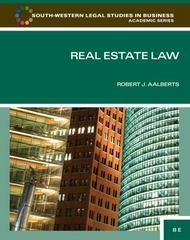 Rather than using a state-specific format, the book covers real estate law generally, offering discussions, short case summaries, longer teaching cases, exhibits, and practical applications that help you spot the issues, apply legal principles to realistic situations, and recognize when to consult an attorney. Coverage of ethical concerns and public policy matters helps you understand key issues relating to real estate law.